Uma Jayakumar, from Bangalore (India), can do over 60 hairstyles in a minute and she can even do it with her eyes closed. 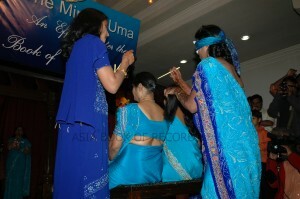 She takes just 30 seconds for doing a sari and another 30 seconds for a full bridal make-up. Comments for ONE MINUTE BEAUTICIAN are now closed.